I’ve a confession to make. Until fairly recently, I wasn’t really ‘into’ Champagne. How crazy is that? My prejudice was that this was a wine whose reputation had been enhanced by a sense of occasion and some fairly serious protectionism by the Champenois, and that it didn’t offer the same level of geeky appreciation as other wine styles. Let’s be brutally honest: adding fizz was a clever way of making an otherwise rather inadequate base wine from northerly vineyards taste good. I’ve now changed my mind, you’ll be glad to hear. Champagne is worthy of serious investigation, but you knew that already, didn’t you? It takes the art of fine discrimination of flavours and aromas another step forwards. Having said this, it’s not cheap. Basic, entry level Champagnes start north of £10 a bottle, and things only start getting really interesting when you’ve dug a lot deeper than this. What first changed my mind? Krug. Back in September 2004 I was at a wine dinner with some chums in Singapore and someone brought along the Krug Grande Cuvée. It was fantastic, with depth, balance, precision and lots of class. Yes, these words are hard to define, but when you come to describe fizz, straight descriptors prove woefully inadequate and instead of reductionist looking-for-flavours-and-aromas you have to start using these more holistic, ethereal adjectives. A year later, September 2005, I got to have lunch with Rémi Krug himself (right) at wonderful London restaurant The Ledbury. As well as the Grande Cuvée, I tasted three Champagnes that will live with me for a long time: the 1988, 1989 and 1990 vintages. The UK is the third biggest market for Krug taking a fifth of production. Volumes have increased over recent years. A couple of years ago about half of production went to the airlines, but with the economic squeeze on carriers in recent years, first class fliers have had to make do with less stellar wines, so no more Krug. But this loss of business has freed up volumes for other markets, and airlines weren’t all that profitable anyway. Krug’s total production is secret, but Rémi disclosed that it is 0.05% of Champagne’s total, perhaps around half a million cases annually. Is there a problem getting good quality grapes, given Krug’s desire to gradually step up production of Grande Cuvée each year? ‘Growers know that Champagne is driven by top-end brands’, say Rémi. ‘They are eager to supply us; we are not in conflict with them’. 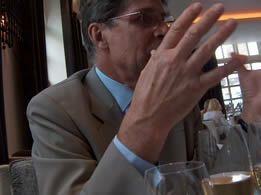 Rémi points out that overall, Champagne production is limited geographically to some 300 million bottles each vintage. ‘The issue is how the system favours those people who have an individualistic attitude’, he explains. ‘There is still space within Champagne for evolutions within that space, to reduce generic offers and produce more Clicquot, Krug, Bollinger and so on.’ He suggests that the way forward for the region is to shift more to the brands rather than making generic Champagnes. 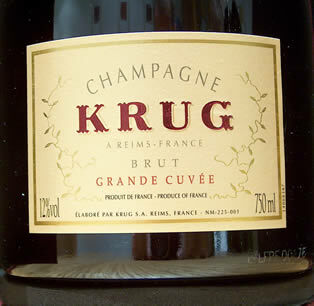 Krug Grande Cuvée is taken very seriously; it’s not considered secondary to the vintage wines. ‘Most Champagne houses create the blend by hierarchy’, says Rémi. ‘We don’t do it that way: it is Krug or out! What doesn’t please us disappears. Grande Cuvée is always our first decision. If there is a conflict, Grande Cuvée wins. If we favoured the Vintage, Grande Cuvée would turn out to be skinny.’ It has one-third to one-half reserve wines from 1990 to 2004. 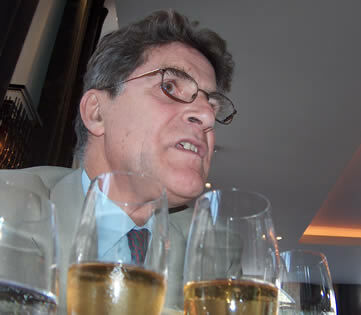 What does Rémi like to drink at home (apart from fizz, of course)? 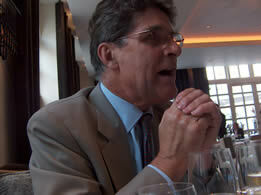 He loves Bordeaux, and particularly admires St Julien for its finesse, delicacy and subtlety allied with character. He also has wines from the likes of Spain, Italy, New Zealand and Australia in his cellar. Is he just trying to sound catholic in his tastes here? It’s hard to tell. Normally, at home, wines are decanted and served blind. Can I come to dinner? Sounds fun.